I have an old Intel DP43BF motherboard. On Intel's website, the minimum bios for all processors listed in this is the same (70). The motherboard was purchased with a Core2 Duo E2220, which booted and worked fine. I wanted to upgrade, so I purchased a Core2 Quad q9400. The motherboard reported a RAM error after installing. I assumed the processor was broken so I returned it and purchased one of the same kind, which again, did not work. I decided to go to a different website (I had been on Amazon and had unknowingly bought the CPU from the same company twice). This time I got a Core2 Quad q8400.... The motherboard reported the same error. Is the motherboard shot? There are no bent pins from what I can tell. The original E2220 still works fine in the board. Do I need a BIOS update after all? Am I just having extremely bad luck with processors? P.S: The RAM is 8GB of PNY DDR3. 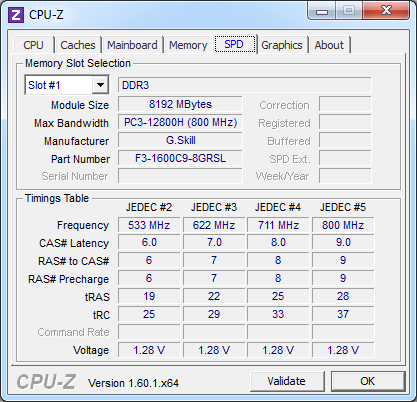 The RAM sticks are both PNY 64COMHHHJ-HS, which run at 1333mhz. check to see if bios set it the right speed? Updated the BIOS to the newest version with no results. The BIOS says the RAM is set to 800mhz, but that's probably just because I'm accessing it using the E2220 since I can't even get this far with the Q8400. I can't figure out any way to change the RAM speed, would there normally be one? Reset CMOS after swapping the CPU, this scrambles the CMOS' contents and forces safe defaults / re-detect due to bad CRC. They actually appear to be running at 667mhz... would this change anything? Can the Q8400 not use slower RAM than its bus? Update: Did this, q8400 is in, no RAM error beep code, but the system seems to shut off and turn on again over and over without displaying anything or beeping. So you went from boot error to no boot. For some reason, what should have been safe defaults made things worse. Put the old CPU back in, re-reset CMOS and see if that still works. If it does, go in BIOS, set memory and FSB clocks to lowest possible, then try the quad again without resetting CMOS. If that still does not work, something might be wrong with the board. Did this, got the same thing: turning on for a few seconds, turning off, repeating. If there's something wrong with the board, what could it be? EDIT: This is to say, the E2220 still worked, the Q8400 is still the same. If you aren't even hearing the POST beep, then the CPU isn't doing anything before boot-looping. I'd say you are down to either yet another bad quad-core CPU or a motherboard that has an oddball issue with quad-core CPUs. Maybe the VRM was defective all along but worked well enough with the E2220 that you never had to question it. The PC stays on when ATX12V isn't plugged in probably because the circuitry that monitors the CPU at boot is also powered from ATX12V and can't shut down the PC or trigger a restart without power. BTW, what PSU do you have in there? If you have an old generic PoS, it could also be that your PSU is too weak to handle the extra load on ATX12V. At this point I'll probably just get a new MOBO, it's not like socket 775's are hard to come by. As for the PSU, it's an "A-POWER AGS Series 620W," but by the looks of it, it doesn't actually meet its rating, so I might as well replace that too just to be safe. Thanks for all the help. As for the PSU, it's an "A-POWER AGS Series 620W," but by the looks of it, it doesn't actually meet its rating, so I might as well replace that too just to be safe. I'd definitely replace that with a decent quality unit from a better-known PSU vendor. At a glance, A-POWER appears to be a poster child for PoS-quality PSUs. This may very well be your main problem. Jfyi, be careful on what you read from reports. Ram is DDR#, which stands for Double Data Rate. Some software reports Data Rate, as in single, not doubled. So when cpu-z reported your ram as running at 667MHz that's the actual Data Rate. You'd see it as the stick says, DDR 1333MHz, Double data rate. Question Will my pc run Apex Legends on semi-below minimum settings?